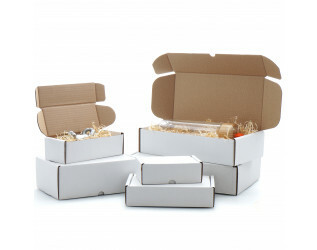 White postal boxes are perfect for mailing products that require protection during transit and shipping. Made from high quality single wall white cardboard, the design includes double lined sides for extra strength, and interlocking flaps to the secure the lid. It is recommended to use clear adhesive tape to secure the lid in transit. 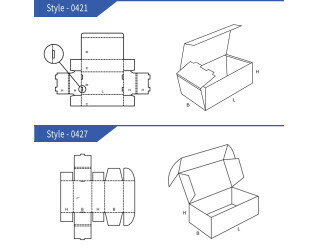 These postal boxes are supplied flat packed for easy storage the FEFCO 0427 style postal box can be assembled in seconds. Our brown postal boxes are available in a wide range of stock sizes with trade discounts on volume purchases, providing a low cost mailing solution. Bespoke sizes are available upon request, and these boxes are also available in brown. A great alternative to the polythene mailing bag, our professional looking postal boxes can also be printed with up to four colours with a company name or logo. Alternatively, we can provide printed tape with a company logo which can be used to seal the postal boxes while promoting your brand. Please contact our Sales Team on sales@ukpackaging.com or 0845 8800355 with any bespoke enquiries. All the postal box dimensions are internal sizes and are measured Length (L) x Width (W) x Height (H). Next day delivery is available for all orders received before 5pm.